Samsung Galaxy A7 (2017) 32GB Blue Mist price in Singapore is recently updated on April, 2019 and is available at the lowest price rate of S$ 355.5 from Qoo10. The beautiful design and impressive features make the smartphone one of the best mobile phones in Singapore. This handset of Samsung is available in different unique colors including . 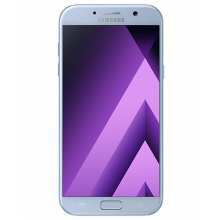 Is Samsung Galaxy A7 (2017) 32GB Blue Mist dust resistant ?